To what extent is business activity governed at a European scale? Since the advent of the recent economic crisis, the EU’s choices about the euro, debt ratios and interest rates have caught the headlines and highlighted the importance of EU decision-making arenas. However, these macro-economic events actually tell us only part of the story about the extent to which business activity is now governed at a European scale. 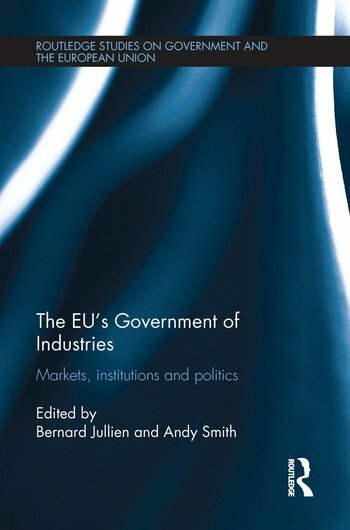 Based upon original research on four manufactured or processed goods industries (cars, wine, pharmaceuticals and aquaculture), and driven by theory that is constructivist, institutionalist and sociological, this book sets out to analyse just what Europe governs, by whom and why. In doing so, it reveals three recurrent features of the European government of industries: its omnipresence, its incompleteness and its de-politicization. The authors show that the many gaps in the EU’s mode of governing industries stem from struggles over economic doctrine as well as the continued unwillingness of many actors to accord the EU a legitimacy to act politically in the name of industrial government. This book will be of key interest to scholars and students of European Studies and Political Economy as well as those studying Political Science, Economics, Sociology and Business Studies. Bernard Jullien is a senior lecturer in Economics at Bordeaux University currently working at the Ecole Normale Supérieure in Paris. Andy Smith is a research professor in Political Science and Director of the Centre Emile Durkheim at the University of Bordeaux.